At the 48th Berufsimkertagen in the Donauhallen in Donaueschingen last weekend all sorts of curious visitors bustled around who did not want to miss the novelties around honey and its production processes. 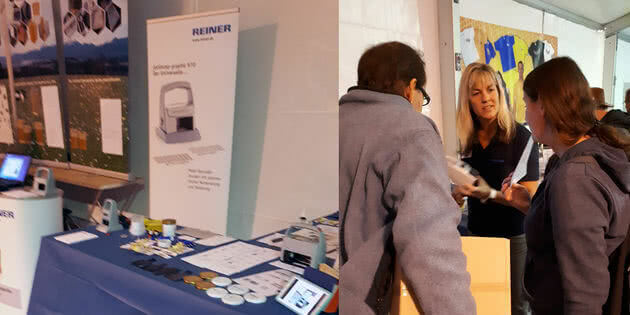 REINER Sales Manager Mrs. Waltraud Eisenmann and her team were also present at Europe's largest beekeeping fair with a booth. the jetStamp 790 MP as well as jetStamp graphic 970 and jetStamp1025. The mobile jetStamp 790 MP printers are ideal for printing on non-absorbent surfaces such as glass or plastic. Thanks to a special ink (MP4), even specially coated labels can be printed smear resistant with the handy printers from REINER. The curved glass bottoms of the honey jars are easy for direct printing of data such as best before date, LOT number, batch number or bottling date with the devices. A high-contrast imprint on dark surfaces such as lids is made possible by the yellow ink that REINER has launched onto the market this year and has thus made possible a place in the popular innovation corners of the beekeeping fair. Even installation in production lines is possible due to the external triggering of the jetStamp 792 MP. The mobile handheld inkjet printers jetStamp graphic 970 and jetStamp 1025 attract attention with the characteristic of printing graphic-capable information directly. Interested trade visitors had the opportunity to test the performance of the two REINER handheld inkjet printers on site. Both the convenient handling of the devices and the smear resistance of the ink were convincing. The high-quality marking devices mastered the challenge of directly printing a wide variety of surfaces with flying colours. Impressed trade visitors and happy supervisors at the booth: a successful trade fair weekend for all participants.